Of course, almost all crab cakes served in restaurants are off limits for those of us who eat gluten free. They usually contain bread crumbs or torn pieces of bread. Some of us have even been told by chefs erroneously that the panko bread crumbs used were gluten free. While there are gluten-free panko bread crumbs available these days, the ones that we were told were gluten free were not. And even if the crab cakes do not contain gluten-full ingredients, they’re almost certainly fried in a deep fryer with other gluten-full ingredients. So I was happy when last year—when entertaining some of my gluten-free blogger friends—I discovered that one of our favorite local restaurants (Sammy T’s in Fredericksburg, VA) not only had a gluten-free menu (not shown on their website), but that gluten-free crab cakes were on it! I’ve ordered a crab cake there a half dozen times since. I always asked anew my standard “due diligence” questions … i.e. ; what the crab cakes contain and how they’re prepared. The answers satisfy (they use gluten-free cornmeal vs gluten-full bread crumbs, their crab cakes are baked vs fried, etc.) and so do the crab cakes! I’d probably give them an 8 on a scale of 10, but for a crab cake not made at home, I think that’s a pretty good rating. Crab cakes don’t often get made at my house. We eat steamed crabs all the time, and almost never tire of “picking” crabs, but picking them out and saving the meat for later is something that we very rarely do. Shrimp’s another matter though. I do get a tad bored sometimes with eating leftover steamed shrimp and, therefore, I like re-purposing it, so I often peel our leftover shrimp and use it in shrimp salad (that makes for truly wonderful Party Puffs, even if it’s just Mr. GFE and me partying! ), Seafood Chowder, or a shrimp version of my Tetrazzini. During the same gluten-free girlfriend get together, one evening I cooked 4 pounds of the Oven-Steamed Shrimp for our dinner. Because we had lots of other food to enjoy that evening and two friends are vegetarians, there was quite a bit of shrimp left over. I decided that the solution would be Shrimp Cakes. I peeled the already-deveined shrimp and cut them into ½-inch lengths using my kitchen shears and adding almond flour, grated zucchini, and grated sweet onion, to create the cakes and then I sautéed them in just a little coconut oil. Seeking shrimp cake success, I made the recipe again two more times, once with eggs and once without, and with finely chopped or semi-pulverized ingredients. My results varied depending upon how much I processed the ingredients. I’d either end up with perfectly-formed cakes or more crumbles. Adding an egg or omitting the egg, was not the deciding factor for the “form” in this recipe. And eggless or egg full, these cakes/crumbles taste great. I came to the conclusion that I far prefer the crumbles though—with the shrimp and other ingredients not finely processed—as there’s more “coverage” with the almond flour and coconut oil, giving more of that coconut shrimp/popcorn shrimp flavor and texture. Yes, Dad would love these Coconut Popcorn Shrimp Cakes or Crumbles. Now, Mom, she’s a much harder sell! And while I serve these without a bun (which admittedly I would probably not heat up), I’m glad that it’s Father’s Day and not Mother’s Day! But now that I’ve told you all that, the truth is we picked up some steamed crabs and invited mom and dad over to enjoy them together. We love the social aspect of picking steamed crabs (it’s a wonderful way to catch up with all that’s been going on in our respective lives!) and we all truly had a grand time, but I’ll make some Coconut Popcorn Shrimp Cakes or Crumbles for Dad the next time I have an abundance of leftover steamed shrimp. Add about 2 tbsp coconut oil to skillet and heat to medium to medium-high. Mix all ingredients, adding 1 tsp coconut oil if omitting the egg. Form into cakes and carefully place in hot oil or drop by large spoonfuls into hot oil for crumble version. Cook about three minutes or so on each side until golden brown. 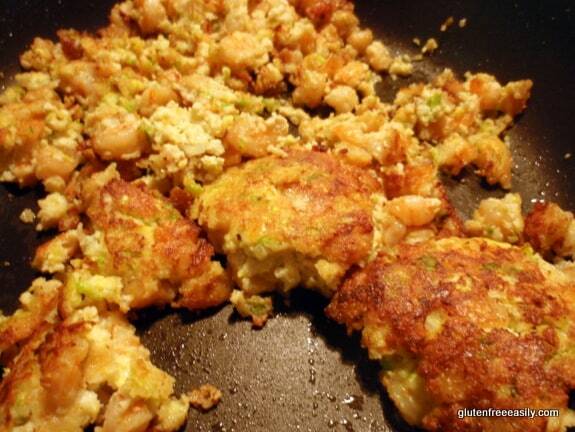 Makes about five average-sized shrimp cakes or many crumbles. Using a food processor/mini-chopper for several seconds to process ingredients smaller will allow you to have perfectly formed shrimp cakes. For crumbles, hand chop ingredients or use food processor/mini chopper for a very brief time, before mixing ingredients together. For eggless shrimp cakes, processing the ingredients more will allow better binding. With eggless shrimp cakes, making smaller cakes and handling them more gently will yield better results. Yummm Shirley! They look delicious to me. I love crab cakes, salmon cakes you name it – I must try making these, especially with coleslaw on the side. I could eat this for breakfast! 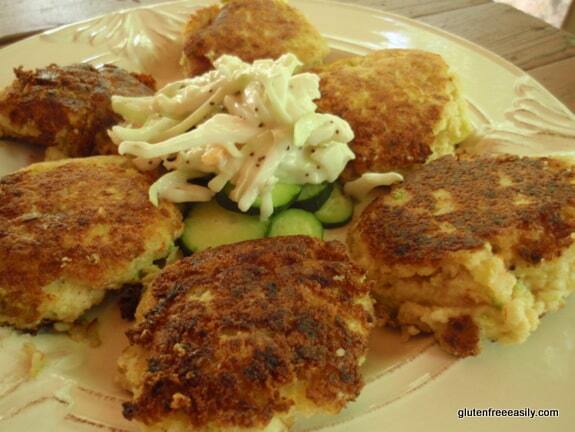 Ina–I’m sure you would love these since you’re a seafood cake fan. 🙂 Btw, that’s my “cheat” coleslaw. It’s just coleslaw mix topped with poppyseed dressing (either Brianna’s or my homemade dressing). I like it far better than traditional cole slaw dressing. 😉 Oh, and yeah, these shrimp cakes are great for breakfast! MMmm, these look sooo delicious! Crumbly or not. I think my mom would love them! Hey Alex–Welcome to gfe, and thank you! Like I said, I actually like the “mistake” crumbles better than the cakes, but both make for some tasty eats. 😉 Hope your mom enjoys the recipe! Why coconut oil? Not being a fan of anything coconut, could another oil be used instead? Hi there, Linda–Welcome to gfe! 🙂 Oh, you don’t have to use coconut oil. I like using it for its health benefits and also for its taste as I love all things coconut. But you could use your favorite vegetable oil or even use pan spray and add some melted butter instead of coconut oil to the mix if you like. Enjoy! Shirley, there are plenty of beautiful foods out there that taste like crap. I would so much rather have a dish like this that tastes amazing! Besides, I think your dish looks and sounds amazing! As recently gone gluten-free (and having grown up in Fredericksburg) I’m absolutely loving to see that Sammy T’s has a gf menu! Now it’ll be so much easier to go out to lunch with Mom when I’m up there. Hi Em–Welcome to gfe! 🙂 I’m so happy to be the one to tell you about Sammy T’s gluten-free menu. 😉 I was thrilled last year when I found out that they had one, and then was totally surprised that the menu included a gluten-free crab cake. Whatever your preferences though, I think you’ll find something that you like there. Enjoy that lunch with your mom in the near future! Thanks so much for the kind words on my blog, too. They’re much appreciated! My hubby would love these, but I’m not a fan of shrimp. Think crab would be a good substitute? Oh how delicious indeed, they sound so yummy! So exciting — I’m passing this recipe on to a friend who’s recently gone gluten-free. There would be no leftovers in my house! These look great! I love how picky your mom is, too. It lets me know that my mom is more normal when it comes to stuff like that and eating out, ha! Jessica–Your comment made me laugh out loud! I can’t tell you how many times my mom has talked about the places that don’t heat their buns and crab cakes that don’t make the grade. Normally, she’s a pretty easy going, agreeable person, but she has high standards for some things. 😉 Maybe we need to get your mom and my mom together for an outing? Hehe. Woohoo!! I love that helped inspire the name! LOL So now, of course, I am SO going to be making these!! And really, they look amazing both ways – as crumbles and as perfectly formed cakes. Now wait a minute on Sammy T’s … I shared your assessment as good, not amazing. Have I done an injustice there? Pray tell. The crabs on the porch were excellent. You didn’t eat your share though … you need to come back soon to do that! Now, you don’t want me to call you out on what you ate, do you, Heather? 😉 But you are absolutely welcome to come any time to try to do better. Hehe. Zucchini is great to add to so many things. It’s tender and sweet, and made these cakes (or crumbles) especially delish. I don’t know what mom would think about me sharing her comments, but I’m telling the truth! Yes, I ATE A CRAB!!! Once the legs were removed I felt a little better. But Debi’s pictures tell a different story! The dads in my family are not fond of shrimp, but I am. I would love these for Mother’s Day. Or maybe my birthday. The cakes look delicious, but I would be interested in trying the crumbles too. I love your addition of zucchini in the cakes. And your mom’s comments reminded me of my grandma! Hilarious!! I was curious to see if you used almond flour! I bet that really adds a great flavor. Sounds delish. Mmmmmm. With my boys gone (meaning my shellfish allergic child is at scout camp), these would be perfect. I do suspect we will enjoy these at dinner tomorrow. These look amazing Shirley. I made crab cakes not too long ago with almond flour and I keep meaning to make them again so I can share the recipe. You have inspired me to get out and buy some crab and make this happen, I love recipes like this. Thanks for sharing. I have to say I love formless foods sometimes. I remember my first attempt at making my own crab cakes, they wound up formless, but good. I think I need to do that again. I did have the crab cakes at Sammy T’s when I went back to meet my friend and I think you are right. They are good, but not great. There is a higher end restaurant here with crab cakes on their gluten-free menu that are FANTASTIC! We go only for special occasions so when I choose that place, Chaz knows it’s for the crab cakes. lol I can’t wait to try this recipe though. I meant to make oven steamed shrimp last night, but we had too many leftovers through the week that I wanted to get rid of. So now I know what to do with leftover oven steamed shrimp! I’m glad you agree on formless and Sammy T’s crab cakes. I think Sammy’s needs to aspire to great crab cakes! I’d like to check out their recipe. Great crab cakes should not be that hard. So glad you have a place that serves fantastic ones in your area. We all deserve that! Sometimes we just can’t get to what we want to make either because there are just two of us. Well, usually that’s the case. Now that Son is home for a bit, the food is disappearing extremely rapidly! So now I have to clarify, Debi! Every time you tried something new, I’d watch your face and wait for your reaction. I always thought, “Oh, she doesn’t like it.” And then you’d proclaim it to be good! So I determined that I was misinterpreting your “thinking face”. 🙂 I do want to see that photo, Shirley. Hee hee! Great idea! I am going to play around with this recipe. Thank you. these look great SHirley! 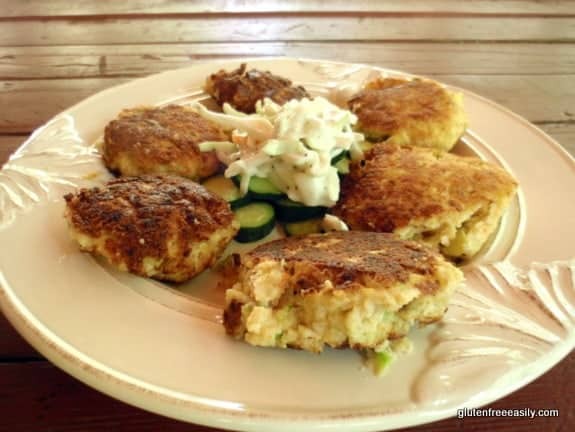 I love shrimp cakes…a much more affordable option than crab!